It tastes great! Most feel Bison is the most flavorful meat they have ever tasted. It has been said that it "tastes like meat used to taste". Many notice a sweeter flavor than beef, which adds to the richness of the meat. Its not "gamey" or wild tasting. Bison meat is just naturally flavorful and tender. It tastes great by itself and will enhance your favorite recipe. 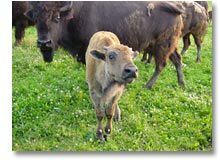 On a cost comparison, Bison falls into the Gourmet category at your supermarket or meat market. The value of Bison is not what you pay, but it is what you get in return. Nutritionally, you are getting more protein, more nutrients, for less fat, less calories, less cholesterol. A value that you can figure into your budget for a balanced, healthy diet. A long time ago, the Indians and frontiersmen, who lived predominantly on Bison, had endurance, agility and stamina. Research is currently being collected on Bison to help us better understand the reasons for this. Due to their independent nature, Bison are handled as little as possible. They spend their lives on grass, much as they always have, and very little time in the feedlot. Because of this, there is no need for artificial growth stimulants or sub-therapeutic use of antibiotics. The members of the NBA felt so strongly about this that the Board of Directors passed a resolution opposing the use of these substances in the production of Bison for meat. Comparisons of the nutritional values of Bison have shown that Bison meat is low in fat and calories and high in protein and nutrients (see chart). In short, with Bison you are paying for a red meat source that is high in protein, low in fat, low in calories - a red meat that fits into the federal governments dietary recommendations that allows you to enjoy more by eating less! Information sources are from public bison materials.